Schwarzenegger to Seniors and Tenants: Drop Dead! Let’s face it, if you’re poor or working-class in America today, you’re out of luck. Big time. If you’re a senior on top of it, forget it. You may as well do the politicians a favor and just drop dead. 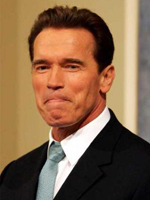 Consider California Governor Arnold Schwarzenegger. He recently eliminated from the state budget the annual renters rebate for seniors that provided a little economic relief (up to $347 a year) to elderly persons on a fixed income. He did the same thing to the tax rebate for senior homeowners. A terminator’s got no time for feelings. Schwarzenegger also nixed two bills that would have assisted renters caught in the foreclosure of their landlord’s property. One would have made crystal clear that the bank or mortgage company that forecloses (and now owns the property) is responsible for returning a tenant’s security deposit. The other would have helped tenants turn back on their utilities (such as lights and gas) when heartless companies shut them off, which, as unbelievable as it sounds, they do. Schwarzenegger’s message to tenants: I only pimp for banks! The California governor is not alone in his disdain for the poor. President George Bush has whipped Congress into a bailout frenzy to save a bunch of privileged dudes on Wall Street who made stupid investments and now need some good old welfare for the rich. Congress has followed suit and is considering its own Xmas in October gift to the predators who created the current mortgage mess. While Congress members are proposing restrictions on the dough, it still wants to reward those who put profits above everything else, including the welfare of our economy. The homeowners who have lost their homes, the tenants who have been without utilities for days or even weeks and who have no chance of regaining their security deposits to help them afford a new apartment, these folks will get nothing. In fact, less than nothing, since they will ultimately pay for the bailout. To the tune of about $2,300 per taxpayer. Which is considered fair only in these callous United States of America. In other countries, there would be mass walkouts. Labor would shut down cities. In America, it’s business as usual.